clean= to make something free of dirt, stains, or mess. sweep= clean an area by brushing away dirt or litter. to move or remove in such a way. move swiftly and smoothly. remove=to take something unwanted or unnecessary away from the position it occupies. to eliminate or get rid of. Since color and typeface/lettering choice is open on this project, I get to chose my typefaces and to do so I looked closely at the form and detail of the letters and thought about their formal relationship to my words. I attempted to visualize a formal connection between the chosen typefaces/lettering and the object words which function conceptually as a unit. So to do this, I thought about what my two nouns look like and how they exist in terms that may also relate to a typeface. 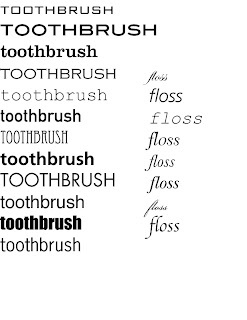 I then researched typefaces and found several that I think will work well with the characteristics of my objects. 1. toothbrush- bank gothic light, clarendon roman, copperplate gothic light, courier new regular, DIN, eccentric std, frutiger bold, futura bold, helvetica book, impact, news gothic.